The Austin Lyric Opera orchestra sounds better and better and the cast of singers is outstanding. We are privileged to enjoy a memorable production of Gounod’s Faust. All begins well. Faust has the opening of the opera to himself, and Jonathan Boyd sings beautifully and compels attention. The scene-stealer throughout is Mephistopheles, and Jamie Offenbach commands the audience from his very first entrance. The silent-screen-villain business is made for him. Once the soul-selling bargain is complete, we first meet the soldier Valentin and then his sister, Marguerite, soon to be the object of the attentions of the rejuvenated Faust. The character of Valentin is essential to the plot and Hyung Yun is an example of the excellent casting of this production. Jan Cornelius, our Marguerite, is a fine physical actress and has a beautiful voice, employed to full effect. From Siebel (Claire Shackleton) and Marthe (Cindy Sadler) to every member of the chorus, the singing is delightful. The music never loses its enchantment, but the embodiment of the plot on stage becomes a bit peculiar, even ludicrous at times. Satan and the three devilettes in red wigs, the tableau vivant in which the figures become animated, the insane asylum, and more just cannot be properly described, but must be experienced in person. Several members of the audience near us really couldn’t completely stifle their laughter, and that’s understandable. In addition, what began seeming to be a sensible utilitarian set and production design required two quite lengthy scene changes behind a closed curtain in the final act. The projection of various words in bad typefaces added nothing praiseworthy, either. At any rate, there’s one remaining performance, today at 3 pm at the Long Center, and tickets are still available. KMFA radio, at 89.5-fm, will broadcast it live, with commentary beginning at 2:30 pm. The music is sung in French and supertitle translations are shown above the stage proscenium. There are excellent reasons for the immediate and continuing popularity of this opera. It’s always a treat to hear it played and sung so beautifully. Learned pigs were new to us. All the acts were fast-paced and expert and some were quite novel. There were feats of strength and balance by two acrobats without props of any kind. A rapid roller-skating act within a very small circumference was astonishing, and so was a high trapeze act that was more about balance than about swinging; the audience scarcely dared to breathe during these. Liberty horses with a high quotient of Arabians were very pretty, and so were Bactrian camels and zebras. A woman on a braced pole was graceful in her strength. The little boys in the audience were especially mesmerized by a dual wheel-of-death act. A pair of bad-boy clowns and a Martian clown new to Earth were both really funny, both for children and adults, although the “undocumented” Martian undergoing an interrogation was for the grown-ups. The tent is air-conditioned and there are molded-plastic seats affixed to the bleachers, all really very comfortable. There was an ATM machine for those who didn’t bring enough money for souvenirs. Refreshments included Coca-Cola, bottled water, palomitas/popcorn, nachos, algodones/cotton candy, alitas/chicken wings, and more. Little boys couldn’t resist the light swords, and little girls loved their lighted butterfly wands. A live band of at least six accompanied almost all of the acts, at a volume that was sufficient but not too loud. Initial safety announcements were delivered in both Spanish and English; thereafter, all was in Spanish except for the act of the trained pigs, whose accompanying people spoke English followed by an announcer’s translation into Spanish. The Web site for Circo Hermanos Vazquez does not appear to have been updated for this season’s new performers. It does announce performances for today at 6 pm and at 9 pm. The location is in the Highland Mall parking lot, with ample parking. Call 1-877-829-7839 to confirm current information. More pictures are available; the audience is permitted to make videos and take still photographs so long as there’s no flash. And there’s a wonderful opportunity for souvenir pictures of children attending; during the brief intermission, the smallest children may be photographed atop a very small saddled pony and one of the learned pigs is available to be included in a photograph. This is a circus for all ages and there’s no need to understand Spanish to love it, although that does help with some of the jokes! In one ring was an entire entertainment, as close as could be. The tent seating five hundred, in folding chairs and on bleachers, was set up on the grass just west of the Long Performing Arts Center, with handsome views in all directions, including downtown. A little pre-show entertainment offered a foretaste of the delights awaiting. To the accompaniment of an accordion and a guitar and incorporating audience participation, we were especially entertained by the very youngest member of the family and the circus, performing with his father and others. Once inside, in the aroma of sawdust, there were high wires, springboards, caparisoned horses, a unicycle, a continuing clown narrative, further appearances by the tiny and charming little boy working with his father, and a commedia dell’arte figure armed with a straight pin, who also seems to be the ringmaster, rigging supervisor, and all-round straight man. Not to be forgotten are the aerial ballet on a rope high above the tanbark or the delightful performing dogs, who took a brief rest while two chickens did a trick. There was an opportunity to pose with the pony for souvenir photographs. Those pulled from the audience to participate in the ring were all good sports, and one young boy who came into the ring definitely displayed the talent of a future performer himself. The most popular souvenirs were toy conga-type drums, embellished twirling batons, and juggling pins (or clubs) and flat rings. We did not see one bored or sulky child in the audience, which was rapt from start to finish, all ages enchanted by the performances. 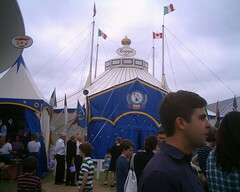 Let us hope that the Zoppe Family Circus returns to Austin.